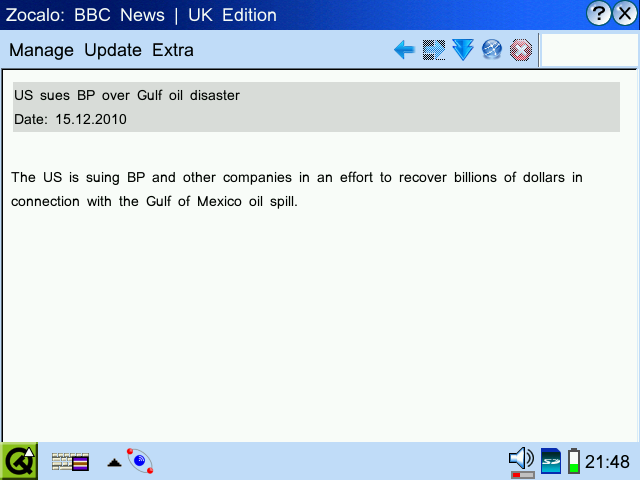 Zocalo is a lightweight web feed reader designed for Zaurus. Web feeds are standardised summaries of web sites. If you want to surf the internet quickly or track a large number of web sites it is faster and more convenient to read feeds and only read whole articles that interest you. 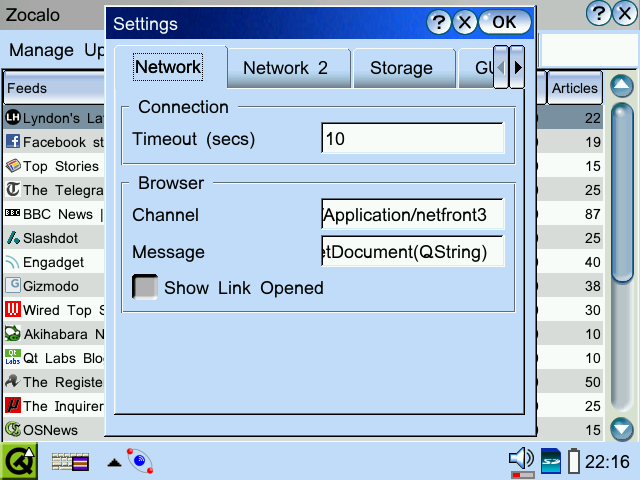 Furthermore, feeds can easily be downloaded and read offline. Transfer the ipk file to your Zaurus and then tap on the icon. If you have already installed a previous version of Zocalo then uninstall it first. You will need to install libcurl, libidn and libz from my Zaurus Libraries page if you haven't done so already. History of changes for previous versions. When starting this work, I wanted a feed client that makes it easy to update my feeds quickly and read them offline because using wireless internet on mobile devices uses a lot of battery power. I wanted a client that didn't use a lot of resources. I don't want to save megabytes of old feed articles. I'm not really bothered about marking which articles I have read or not. RSS 2.0 recommends 20 articles as a limit to any feed anyway. 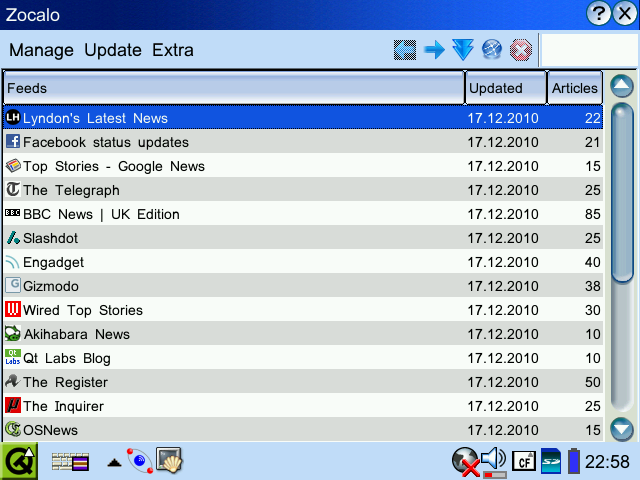 There didn't seem to be many web feed readers for the Zaurus, one that I had been using was ZauRSS, but it was missing many features and I didn't like the GUI. Fortunately Takatsugu Nokubi, the author of ZauRSS, had kindly made his source code available so I downloaded it and started rewriting it to satisfy my needs. The menu and toolbar icons are the Crystal icons by Everaldo, the default feed status icons are from Wikimedia and the Zocalo icon is my own design. Use the cursor keys to navigate. Toolbar icons are from left to right: switch view out, switch view in, update current feed, open in browser, and stop transfers. In portrait view use the jog wheel, OK and Cancel buttons to navigate. Only one transfer is active at any time but you can update all feeds from the menu, they will be downloaded in sequence. The articles view shows only articles that were in the feed when you last updated it, articles from previous updates are not stored. After an update, new articles are marked with a different colour (see settings) but articles that were present the last time you updated will be black. When you exit Zocalo the article status is cleared. If you are short of space you can clear the data in the saved feeds (but keep the list of feed URLs) via the Storage tab in the Settings dialog. Some web servers do not return the Content-Length header so for those feeds the progress bar will not move. The version number does not reflect the status of the software and is an arbitrary number chosen by myself. Please kindly report bugs and usability issues to the Zocalo thread at the OESF forums. I have been writing feeds by hand and using scripts to help automate that process for some time now and I think web feeds are great. The standardisation is not. There are 3 standards for web feeds, RSS 2.0, RSS RDF and Atom. In my opinion, RSS 2.0 is the best: simple and easy to write but its specification is not as clear as it could be. RSS RDF requires a lot of parsing and is less simple. It is not as suitable for a lightweight client on a mobile platform or if you write the feed by hand. Atom is good but still uses too many RDF-like features. When a human reads RDF it is difficult to imagine how it will be parsed. When writing a feed or a feed module I think your philosophy should be to choose a standard and follow it. Keep it simple. Don't add images, HTML or CSS to the article descriptions. Don't include the whole article in the description, make a summary. Avoid using additional namespaces. I despise advertisements in feeds, it is not meta data. I don't believe feeds are in any way similar to email. I don't think a web feed reader should treat them with the same paradigm of number of "unread" and "read" messages; although I did eventually introduce a limited version of this into Zocalo. I want to use a feed reader to skim a number of websites and pick out the articles I want to read in more detail. Some of them I will want to go to the web site and read them in a web browser. Or I will just want to read a summary because I don't have time to read the article thoroughly. Parsing of allowed HTML tags in Atom feeds. Note: text that is crossed out using the strike tag, e.g. deleted, will appear as "x-deleted-x"
Support for Internationalised Domain Names (IDN). Remove <script>,<noscript> and comments from article descriptions. Parse some unsupported HTML entities out of article titles. Fixed problems preventing Zocalo from opening in portrait mode. Cancel button can now be used to navigate out of views; same as the left arrow tool button. If the current view is the Feeds view then cancel will exit the program. Settings icon removed from tool bar for more space in portrait mode. Memory leaks were found and fixed. Bug fixed - proxy password now saved correctly. Faster opening of Zocalo window by postponing some start up functions. All feeds are now saved straight after update to reduce the time needed to save feeds on exit. Open Browser icon is now ghosted during an update. Bug fixed - open browser function opened wrong article if feed order was modified. Bug fixed - navigate out function switched to the wrong feed after an update. New menu option to reload a feed: Reload Feed will delete all feed details except the position in the feeds list and the feed URL. It will then be updated. Menu and toolbar items that are not applicable are ghosted. Feed titles made visible prior to downloading during Update All: The feed table will now scroll during update if your list of feeds take up more than one screen. Attempt to handle wrong MIME type for ICO files. Better handling of downloads when user changes selected feed during update. Bug fixed - articles list was resized wrong; broken in 1.5. Bug fixed - adding more than one feed offline. Bug fixed - detecting Atom post service as a feed. Bug fixed - handling feeds at start up incorrectly. Support for multiple enclosures in Atom feeds. Switch from Tango to Crystal icons. Toolbar now uses arrows to "go into" a feed and "come out". Downloaded feeds are now saved to disk individually, previously all feeds were saved together. Exiting the program will be much faster if only a few feeds were downloaded. Feeds are periodically saved as you read them. There may be a delay when starting Zocalo 1.5 for the first time if you upgrade from a previous version. Feeds may be rearranged in the Feed View table. Use Fn-U and Fn-D or the context menu to move the selected feed up or down. Proxies that require a username and password are now supported. If date parsing fails, the date parser will now try to read Atom format dates for RSS feeds and vice-versa. 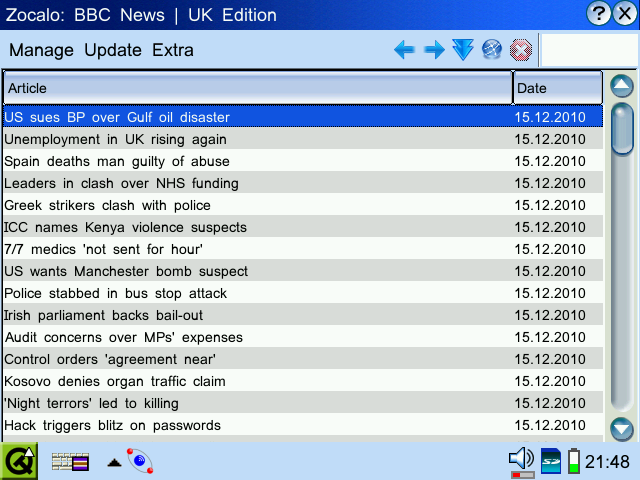 Many feeds use incorrect date formats. New, reliable extraction of feed URLs from website index page. Zocalo will search for website icons when a feed is added by both feed URL or website URL. Search in the default location, /favicon.ico. Please note this is not best practice: a favicon should be set by the website using a <link> tag. Refresh the feeds view so that new icons show up immediately. Status icons for feed status (red = invalid, yellow = unknown, green = good). More unwanted HTML tags parsed out of article titles. After an update Feeds that have new articles are highlighted in the Feeds View. Settings icon added to toolbar. Settings dialog cleaned up and more options added, including choose font face. Improvements to usability, e.g. when selecting "Update All" the main widget will switch to show the feeds view and each feed will be highlighted as it is downloaded. Minor bugs continue to be quashed. *2 This is limited to one enclosure per article which is fine for RSS but Atom supports multiple enclosures. Added support for portrait mode using jog wheel and OK button. Press OK quickly to navigate in, press OK and hold to navigate out. Press and hold stylus on feeds in Feeds View for context menu. Automatic discovery of the feed if you enter the URL of the website. Change the colour of the stripes, the same colour is now used as the background for an article's header. Change the colour of new articles. Bugfix: Actually use the specified qcop signal if you change the browser. Note: if you are upgrading from 1.0 then feed updated dates will not use the new system until you have updated them.